Standing on University Avenue in downtown Toronto, Linda Borau holds up a sign with the words “Canada out of Afghanistan”. The Canadian woman has joined hundreds of protesters for a demonstration against the Canada’s combat mission in Afghanistan’s Kandahar province. Borau is shocked by the “change in language” around the operation, she says. Initially she thought that the Canadian forces were engaged in a peace mission in Afghanistan; this year it has become evident that Canada is fighting a war. Across Canada on Saturday, thousands of people protested against Canada’s role in Afghanistan – the first such protests since Canada sent 2,300 troops to Kandahar late last year, to provide security as part of the NATO mandate. Over 40 Canadian soldiers have since died, mostly in suicide attacks by insurgents and in military operations against fighters of the former Taliban regime. Supporters of the Taliban are strongest in the southern provinces of Kandahar and Helmand, where British troops are stationed. Thousands of Canadians took part in demonstrations against Canada’s involvement in the war in Afghanistan on Saturday, like here in Toronto..
Canada has not lost that many soldiers in a military conflict since the Korean War in the 1950s.The country prefers to focus on peace missions and humanitarian interventions. While the Canadian operation in Kandahar was hardly noticed when it began last year, it has since become a steady source of front page news. Almost every week, Canadians are killed. But the exact purpose of the operation is not obvious to everyone, and there is no clear sense of progress. As a result, there is growing unease over the mission among Canadians. According to Layton, the operation in southern Afghanistan is “unbalanced”, a reference to a report published last week by the Senlis Council, an international think tank. It says that for every dollar in humanitarian aid in the region, $9 is spent on military costs. That is the wrong approach to win the confidence of the Afghan population, according to the group, especially since there is a famine among displaced persons in Kandahar. By participating in the combat mission, “the Canadian government has joined the U.S. foreign policy,” says John Etches, a protester at the march in Toronto. Recent opinion polls have uncovered doubts about the mission in Canada. Earlier this month, an extensive poll showed that 59 per cent of the Canadian population thinks that Canadian soldiers are dying for an unwinnable cause. On the other hand, a survey published this weekend showed that a slim majority of 55 per cent does support combat missions for the Canadian army, provided there is a credible rationale for them. 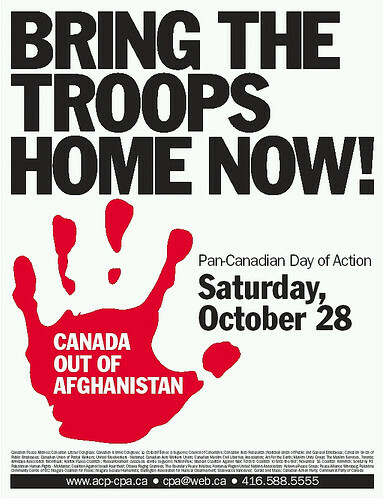 Publicity for the national Day of Action against Canadian participation in the conflict in Afghanistan. The change in attitudes about the war in Afghanistan is a political problem for the Conservative government of Prime Minister Stephen Harper. Harper, who is governing with a parliamentary minority, is a strong supporter of Canadian involvement in the international fight against terrorism, alongside the United States. He has pledged Canadian presence in Kandahar until 2009, possibly longer. Although Afghanistan was hardly an issue in the Canadian elections in January of this year, that will probably be different at the next elections, which are expected next year. Harper is hoping for improvement in the situation through reinforcements in southern Afghanistan by other NATO countries. Canada, which for years has stayed on the sidelines when it came to combat missions, is now punching above its weight within the NATO operation, according to most observers. Like the NATO leadership, the Canadian Minister of Defense, Gordon O’Connor, has suggested this month that other NATO countries who are based in the much quieter north and west of Afghanistan should send their troops to the south, where the need is greatest. Canada’s foreign minister, Peter MacKay, has also insisted on that – and he is planning to do so again at a NATO summit in Latvia next month.